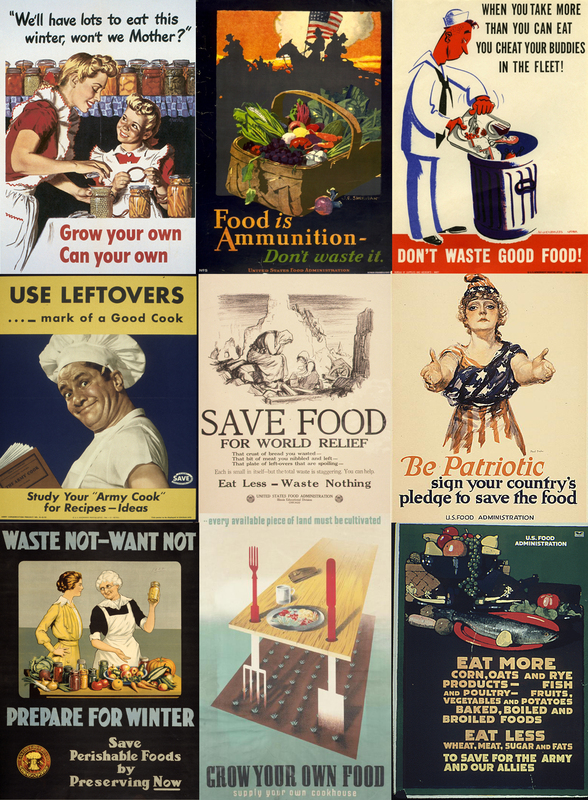 When I see American food propaganda from the time of the World Wars, I can’t help wondering, “Why don’t we have ads like these anymore?” A Google search for ‘world war food posters’ returns dozens of images with messages like “Sow the Seeds of Victory: Plant and Raise Your Own Vegetables” and “Lick the platter clean, Don’t waste food.” My favorite is a basic print that reads, “Food – 1. Buy it with thought 2. Cook it with care 3. Use less wheat & meat 4. Buy local foods 5. Serve just enough 6. Use what is left – don’t waste it.” Waning off meat and gluten, shopping local, vegetable gardening – nowadays, these are considered trends of rich people who have read one too many health journals, but they used to be government-endorsed practices. 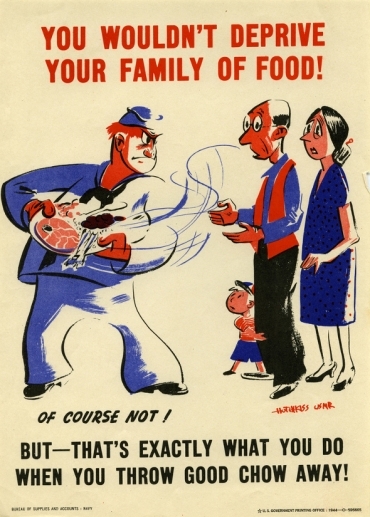 The point of these campaigns was to make sure citizens had enough to eat while the government diverted as much food as possible to the soldiers on the battlefields. Sustainability was considered a patriotic duty, and people were taught to cherish every piece of food they could get their hands on. So, what happened? Why have we stopped cherishing our food? Well, the answer is simple: when something exists in abundance, it isn’t considered valuable. In fact, overabundance creates a sense of dispensability. With grocery stores offering us rows upon rows of food, vending machines filled with snacks seen anywhere from shopping malls to workplaces, streets bursting with competing restaurants, and even office supply stores selling treats, you get the sense that food is everywhere. You realize, subconsciously or not, that even if you, say, toss out the last half of your sandwich, there are plenty of ways to get more food. We throw out good food, or allow it to go bad, because we see it as a disposable commodity. Instead of massive public awareness campaigns teaching us to value food, we see ad after ad for cheap eats. In fact, the only anti-waste television commercials I have seen came from Ziploc, whose goal was just to sell plastic bags. I can’t be the only one who finds this temporal disconnect with food disturbing. American society has gone from espousing ‘only take what you will eat’ to annually wasting 25-50% of domestically produced food. Although we are fortunate enough to have ample resources to produce *seemingly endless quantities of food (*not actually, unless the food system makes some major changes), we shouldn’t feel entitled to waste it. Current nutrition– and health-oriented government initiatives are very important, but sustainability is just as critical and merits more publicity than it currently has. Sustainability and waste prevention need to be re-embraced as causes that every individual can and should work towards. Most importantly, we need to take a cue from our rationing ancestors and treat our food with respect. Food, in all its delicious glory, keeps you alive. Show it some love. Posted on August 5, 2014 August 7, 2014 by saynotofoodwastePosted in BlogTagged food, food waste, sustainable, world war.